So your planning your rustic woodland wedding and you're either the "not so traditional" couple or you're just really not that into champagne. 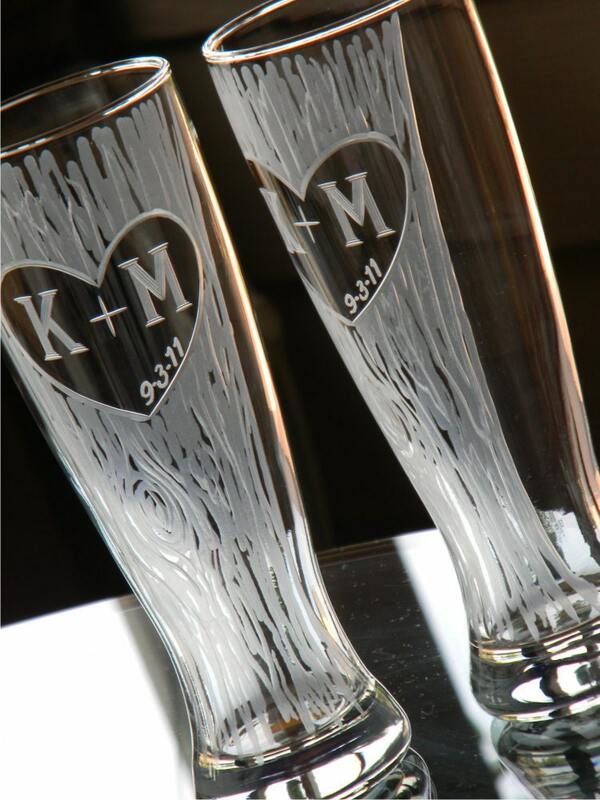 Toast to your new life together with these hand carved 23 oz beer pilsners that display your love for each other. Your initials are cut into the heart and tree design that has all been hand engraved just for you. Each piece these start out a blank hourglass shaped beer glass and I hand cut this rustic heart and tree design into the glass with my stone wheel using three different stones to create a realistic tree bark affect. I finish with your personal initials and wedding date to make them a memorable keepsake of your special day! These are also a great Anniversary gift for the not so traditional couple. This attractive pilsner features a heavy base and comfortable curved shape body that feels good in your hand. It holds a whopping 23oz of beer while displaying a nice head of foam. I bought these beautiful custom glasses for my friend's bridal shower after seeing them two years ago in the Uncommon Goods magazine. They are absolutely gorgeous--the artistry and craft is truly unique, especially since Jen doesn't use any templates! Amazing! I'm so grateful to Jen for making these and shipping them in time to give as a gift. My friend loved them. Gave as a housewarming gift. Went over well. Jen was super nice and accommodating and answered all of my annoying questions. I wanted these glasses as a bridal shower present so I had a deadline and she beat it no problem. The glasses are beautiful and I highly recommend them as gifts or for yourself. She is very talented and I would definitely order from this shop again.